Keeping with the Dominaria theme I have going this week, I thought I’d share another brew that came from my session over the weekend (buying a box will do this to you). Despite there being a bunch of legendary creatures in the set, most of them didn’t appeal as a full on general. Many of the legendary creatures that I pulled from the box went into the 99 of other decks, where their support was most needed. Ditto for the legendary “others” (artifacts, sorceries, and other cards deemed legendary). However, there were a select few legendary creatures from the set that inspired me to create something new, regardless of if that new brew would be competitive or not. Like the new buy-a-box promo commander build that I wrote about recently, this was one of the new creatures from Dominaria that I wanted to build a deck around. First of all, I’m a sucker for the Orzhov color pairing, and have a bunch of experience building decks with it. Second, I’ve built nearly all of the old school tribes from the original sets — and Knights finally have some legit support. Finally, I’m rather good at building budget to mid-tier decks because you can find busted interactions on any budget, but you can’t combo off on turn 2 or 3 for $150 (current Card Kingdom pricing is sitting at $134). Let’s get to it, shall we? Aryel, Knight of Windgrace isn’t a lord in the traditional sense. Lords initially started out as a sub-type of Creature, but were classified as Lords. Lord of Atlantis and Goblin King are early examples of this (they are also good examples of early tribe support). Landwalk abilities are pretty much a thing of the past, but a lord giving creatures they share a type with +1/+1 is still a standard ability for most. In this instance, Aryel doesn’t fit the lord moniker so well but she does have plenty of the Knight keyword in her rules text along with being a Knight herself. Like a good 2-color commander, she has an ability that requires white mana and another that requires black. 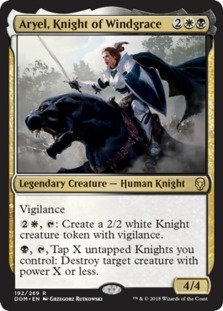 Being able to pump out 2/2’s with vigilance isn’t that bad of an ability (and if you were playing this in the Brawl format it’s probably more busted), but more importantly for a black and tapping a few other knights you can destroy creatures at will. Removal is already strong in this color pair, but I feel like this should be an aggressive, creature-based deck. It turns out that there has been some attempt by Wizards of the Coast to provide support to the tribe, and given that you have access to nearly the entire back catalog of cards you can finally smash enough of them together to make a serviceable deck. I’m happy that Wizards has been focusing on giving some of these forgotten tribes support, and hope that they continue to do so because the tribal theme is pretty fun to build around. Let’s take a look at some of the creatures I’ve included and the reasons why. Bear with me here, there’s a lot to take in. First off, there are some legendary knights around that we want in this deck for various reasons. Some of these knights have life link, so there’s some fun things we can do with our life total, like destroying permanents by paying life with Vona. Elenda can also make a ton of tokens if she gets big enough before dying. I’ve included an equipment sub theme and a ton of lord effects to beef up the mostly 2/2 squad we’ll be running. There are tutors for various things, like using Thalia’s lancers to pull out one of the legendary knights, or Knight of the White Orchid to get extra mana. There’s a pair of Knights with shadow that essentially can’t be blocked but can be pumped after blockers are (not) declared. Another pair gets +1/+1 depending on the amount of lands opponents control (admittedly weak if not playing against anyone playing White or Black). Other synergies include Archetype of Courage and Kwende, the former giving all creatures First Strike and the latter giving them all Double Strike. With the right amount of ramp, you can get a pretty solid army going. But you’ll need some help to do so. I’ve added all the tribal goodies like Coat of Arms and Vanquisher’s Banner, but also included many of the anthems from recent sets (or recently reprinted). Lastly, a duo of Planeswalkers that can create further Knight tokens to beef up our already solid army. That’s really all this deck wants to do, is make a ton of 2/2’s and then beef them all up to 7/7’s and wreak havoc. Boardwipes will probably be an issue, but so be it. You can’t win ’em all, right? You can see the full decklist here.